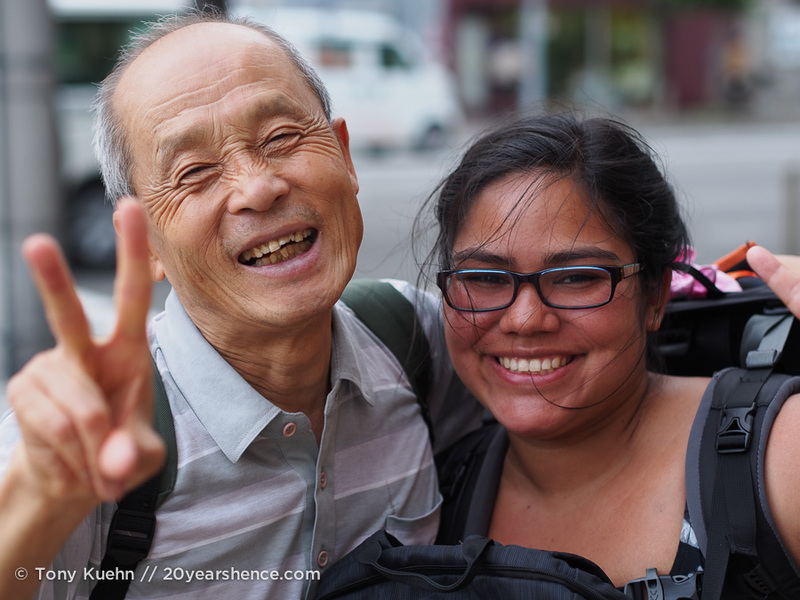 Shijo was super friendly, and if he is to be believed, traveled all over the world changing religions as he went in order to get free accommodations in temples. Despite all the kindness we had experienced, nothing had prepared us for what would happen on an otherwise ordinary afternoon in which we decided to engage in a little geisha spotting. 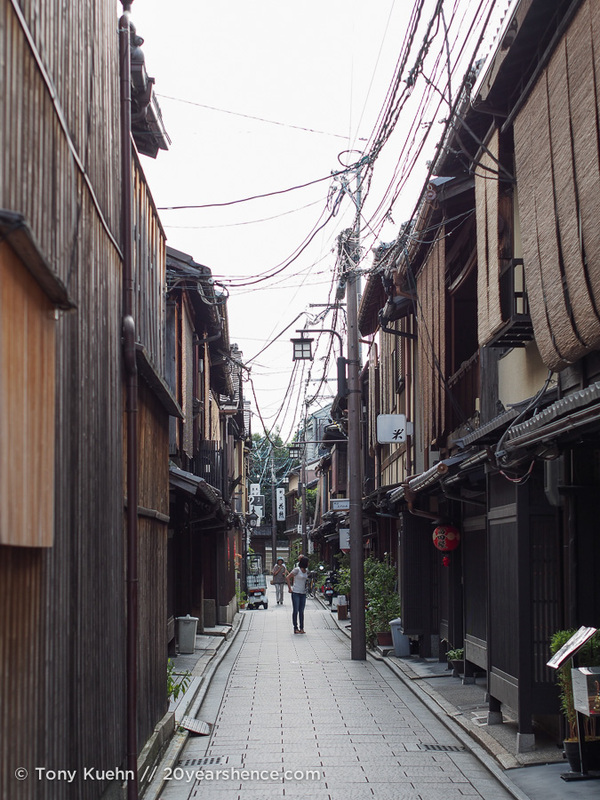 We were tired from a morning spent temple-hopping, but seeing how Gion—the most famous geisha district in Kyoto—was but a stone’s throw from our hostel, we decided we would mosey on over and check the area out. 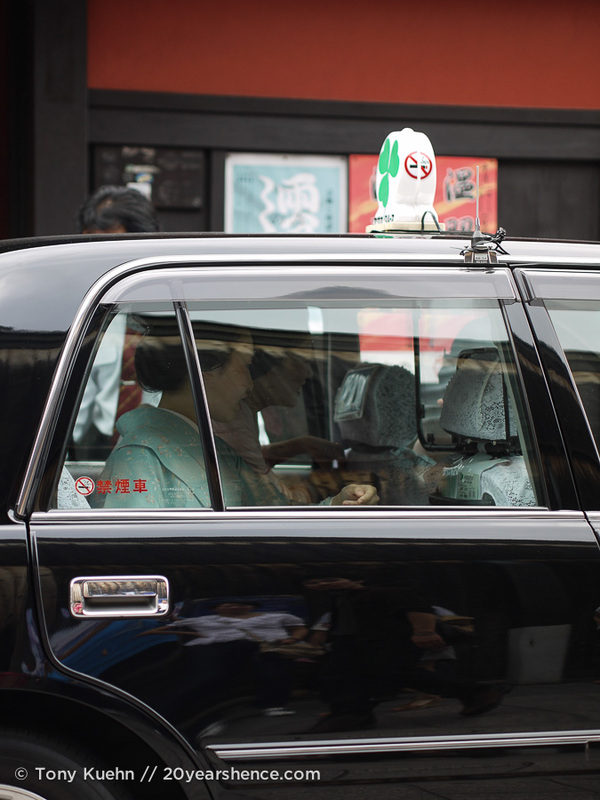 Perhaps if we were lucky, we might even see a few geiko (the preferred term for geisha in Kyoto) on their way to work! 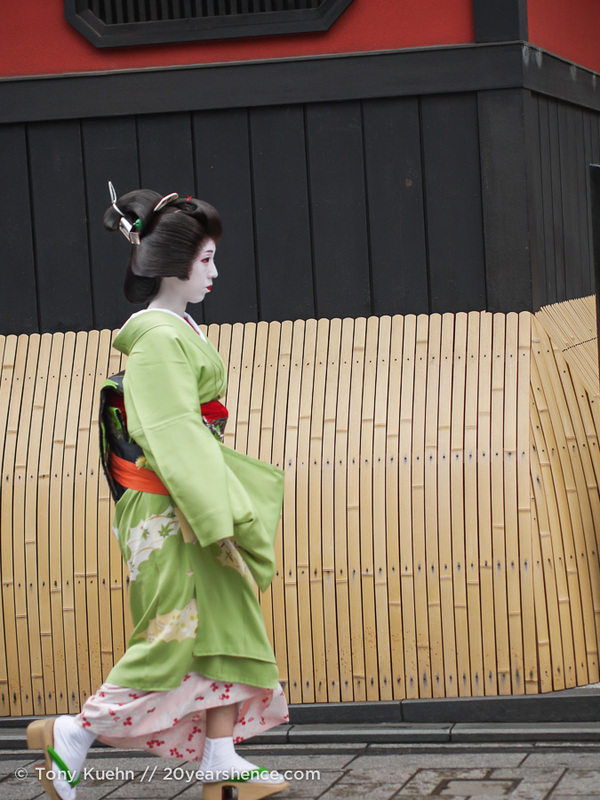 OK, obviously I wasn’t really going to leave everything to chance: I know that the number of geiko working in Kyoto these days is miniscule so the odds of seeing one is incredibly rare. 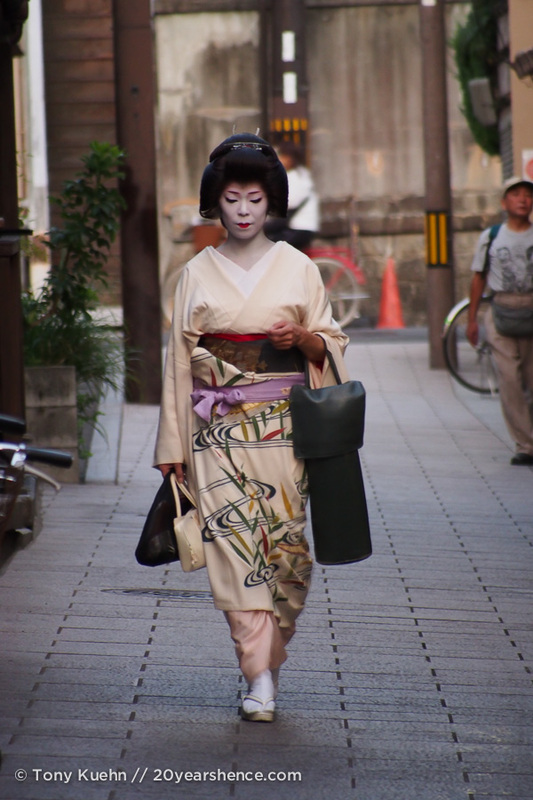 In order to increase the likelihood that we might see one, I did some online sleuthing and discovered that the optimal time to see a geiko is around 5:30 – 7:30 pm, as this is generally when they head out for evening appointments (as the daytime is reserved for lessons and primping!). 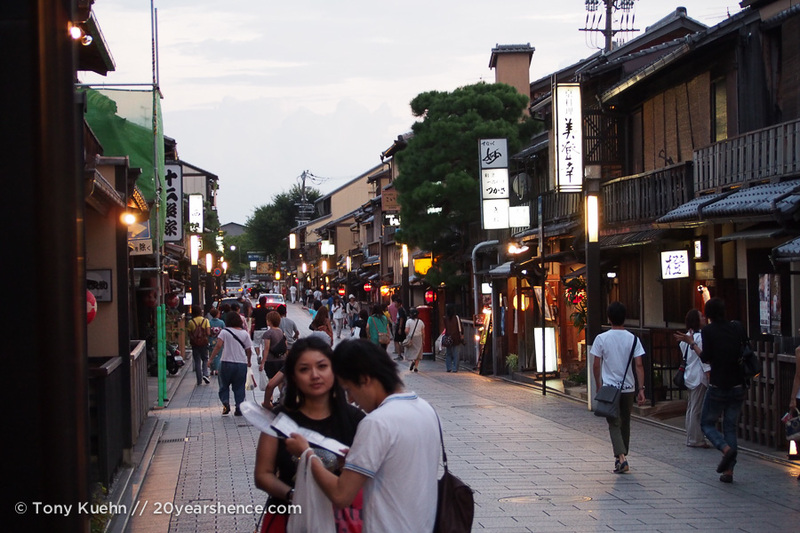 As it was still early afternoon, we spent some time walking down the main drag of Shiyo-Dori, popping into the expensive shops, before finally heading into the back alleys where the old streets and buildings have been preserved. 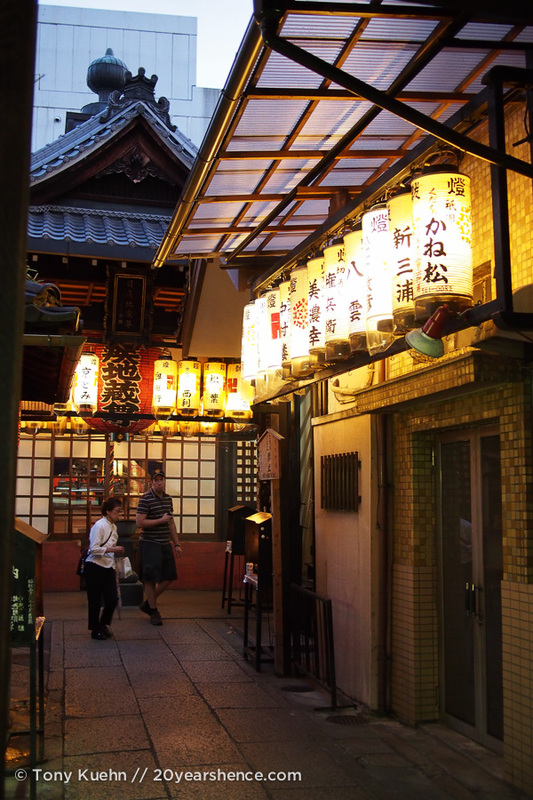 In one block you suddenly feel as though you have been transported back into old Japan. Truth be told, this area felt far more hidden and far more authentic than many of the other so-called “old” Japanese places we had sought out, and because we were wandering around in the middle of the day, the streets were largely abandoned so we were free to roam and wonder about what was going on behind the closed doors in peace. 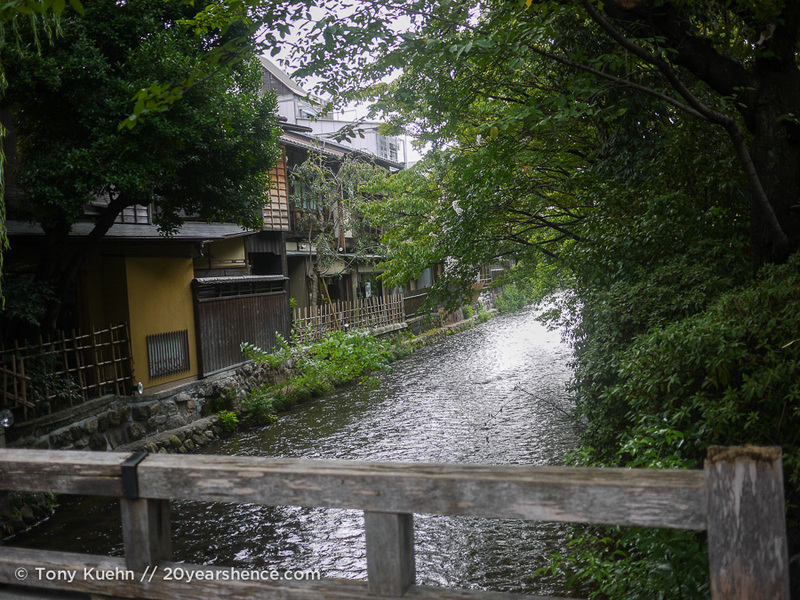 We meandered over to the Gion Tatsumi bridge and watched the river flow beneath us, simply soaking up the atmosphere and reveling in the fact that in a parallel universe we would be back in Nashville, back at work, instead of resting beneath a willow tree in Japan. 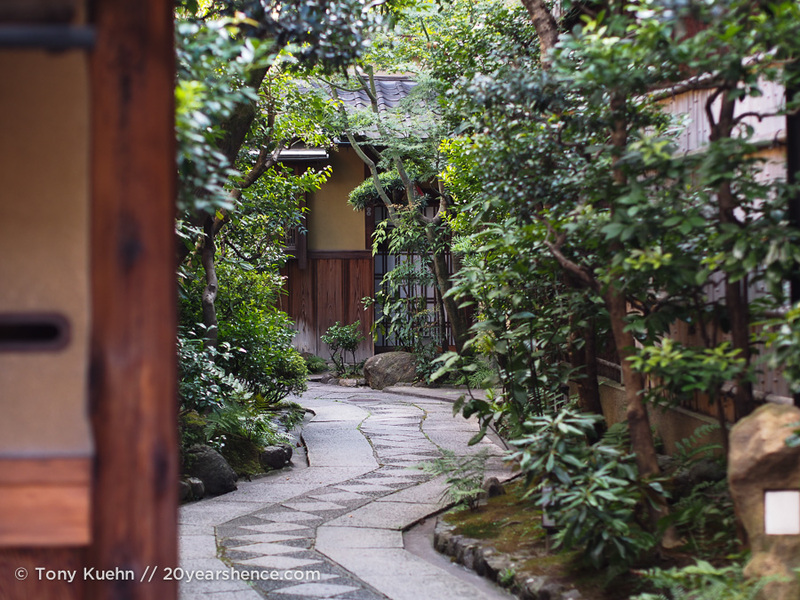 The moment was as surreal as it was beautiful, and we thanked our lucky stars that we had taken the time to slow our pace here in Kyoto so that we could fully inhabit these moments. But time stops for no one, not even long-term travelers, and soon our watches were telling us that the witching hour was drawing near. My online investigations had also suggested that there was one building in particular that seemed to attract a disproportionately high number of geiko, so if we could find it, our chances of seeing one would increase significantly. 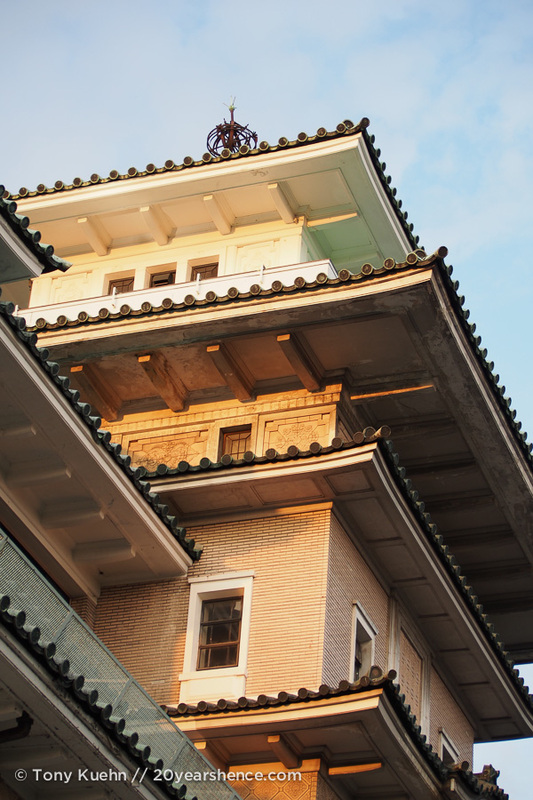 The online poster had said that this building was one of the oldest geiko schools in Gion, which is why it was so popular. I couldn’t quite remember where this building was located, but we found a building that I vaguely recalled having seen in the photo online and we decided to set up a stake out there and hope for the best. We figured that, like a lost child in a shopping mall, our odds of seeing a geiko would increase if we stayed put rather than rambling about. We waited in front of this building for nearly an hour, wondering every 5 minutes or so if we were even in the right spot. We figured we had nothing better to do than wait, so wait we did. And finally it paid off! 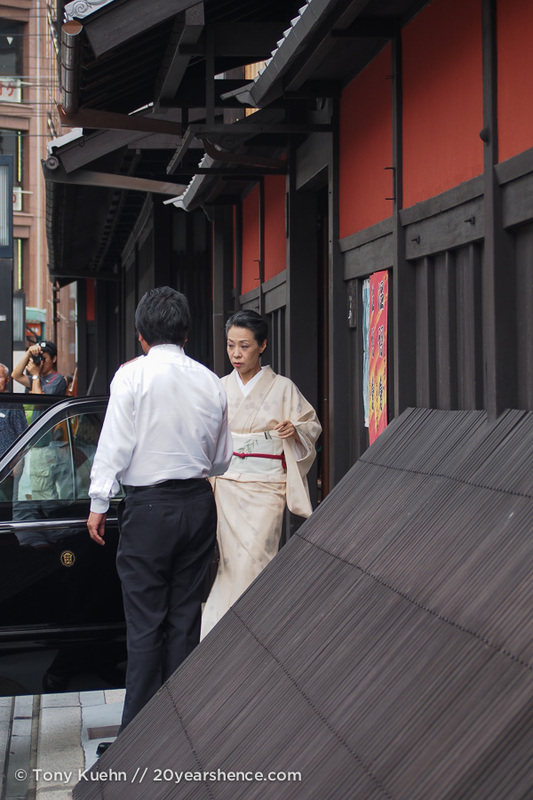 A black car had pulled up in front of the building we were watching, so we primed ourselves for some geiko to emerge from the courtyard within. Tony walked across the street so that we would both have different vantage points and we crossed our fingers that if anything happened, one of us would get a decent shot. 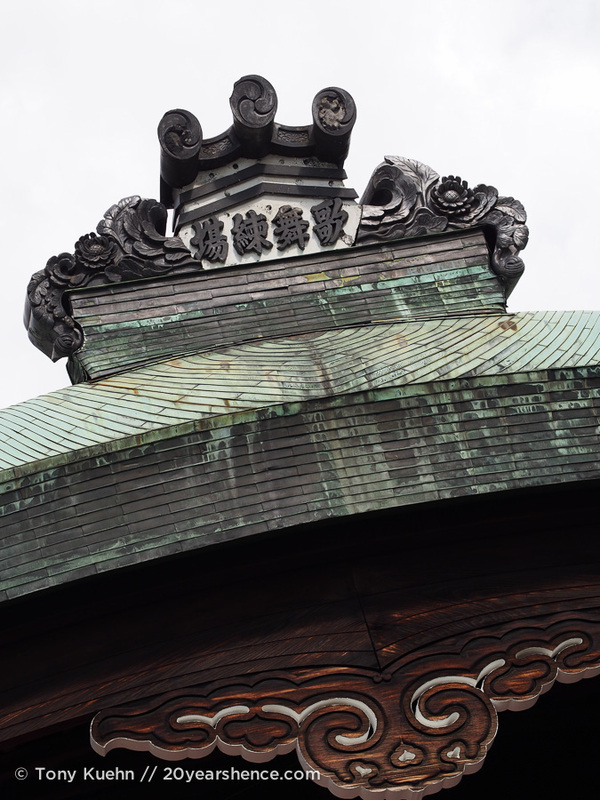 An older lady dressed in an elegant kimono pulled a small curtain guarding the opening aside, and out popped two geiko! Tony and I frantically did our best to take as many photos as we could from a respectable distance (we may have been staked out like paparazzi, but we weren’t going to hound the poor girls as many other visitors to the area unfortunately do). As the car pulled away, I joined Tony so that we could compare our photos. They weren’t stunning, but they were about on par with what most people manage to get, and the important thing is that we had seen not one but TWO geiko! We were all ready to call the night a success and venture off to find some dinner, when an older Japanese woman struck up a conversation with me and asked to see my photos. 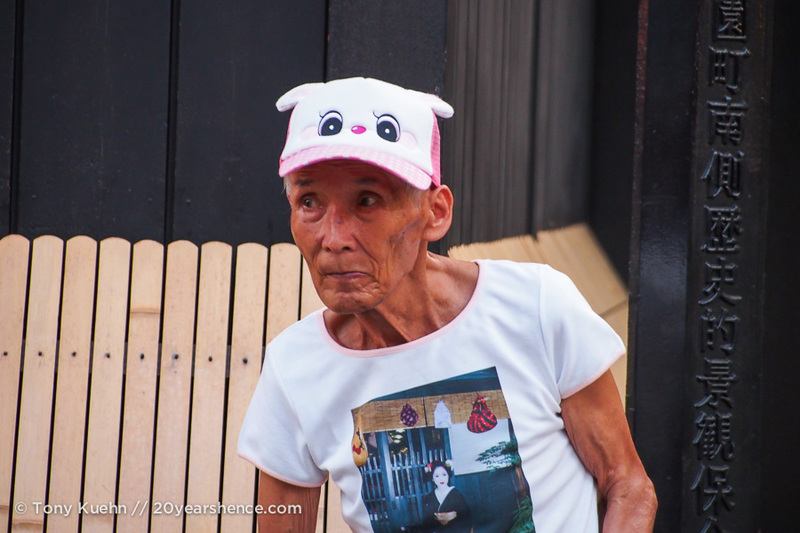 I showed her the pictures I had managed (some what embarrassed at their lack of finesse), and she pointed out that the older woman I had captured on film was actually the matron of the teahouse we had been standing in front of. 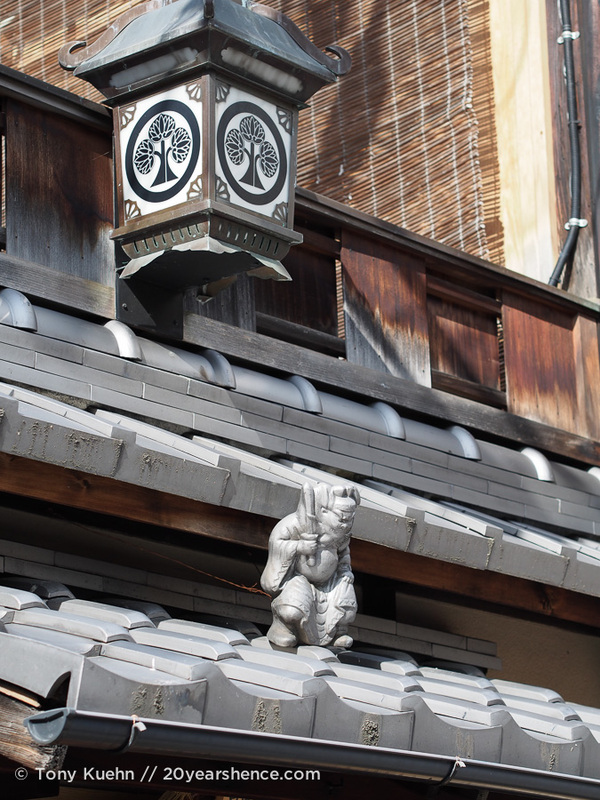 Turns out, we weren’t at a geiko school at all, but were standing in front of the Ichiriki Chaya, one of the most famous teahouses in all of Gion! What followed was a delightful conversation as the woman introduced us to her husband and asked us a bit about our trip and where were from. She beamed and her eyes lit up with fond memories when I said I was from Canada, as she and her husband had honeymooned there many years ago. 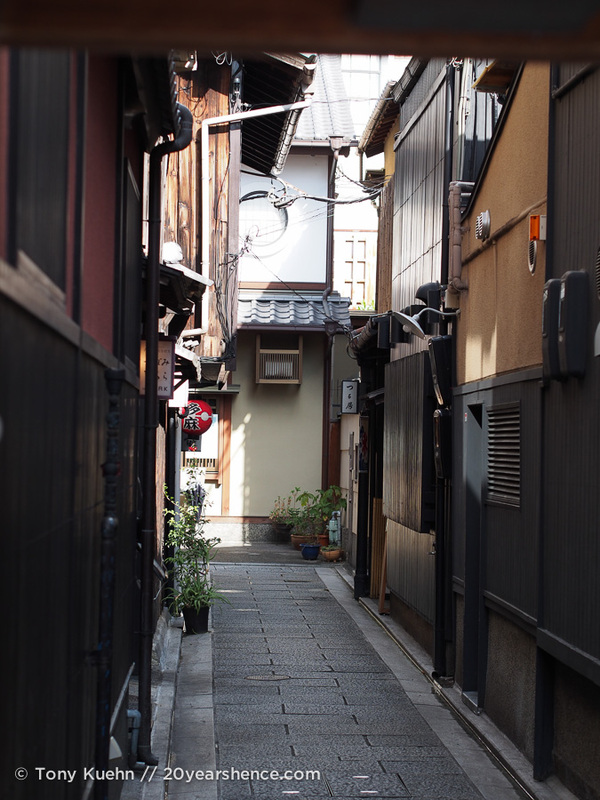 We also learned that her husband, now retired, was a photography enthusiast whose personal specialty was taking photo of the geiko in Gion. And not the “running papparazzi” style photos we had felt lucky to secure, but beautiful, otherworldly posed portraits. She had a folder with some of his prints and proudly displayed them to us, identifying each girl by name as we admired her husband’s gift with a camera. I can’t tell you why this happened, why out of all the other people loitering about, these two people should have singled us out and become our benefactors for the evening, but for some reason they took a shining to us and took us under their wings. They made it their mission to make sure we got plenty of “pretty” pictures as souvenirs for our time in Kyoto. 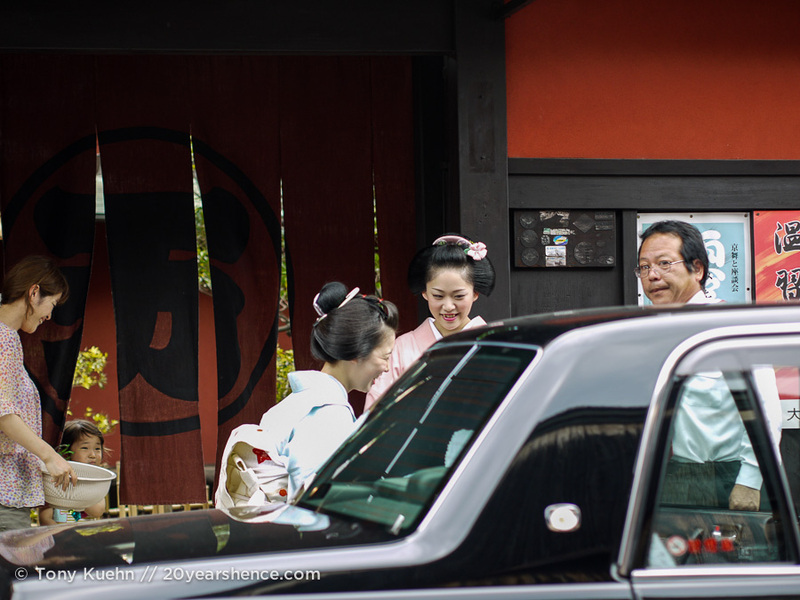 Given their familiarity with the geiko, the two knew exactly where the big parties were and where we needed to be to meet the geiko. 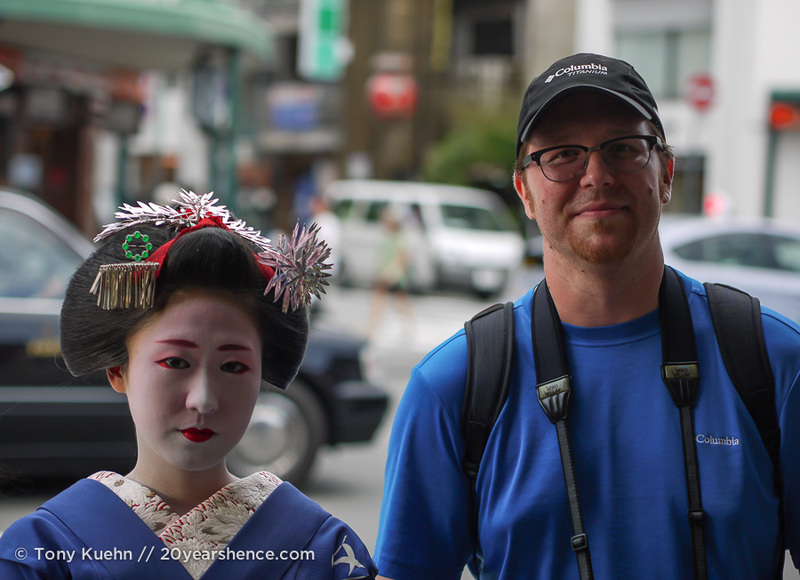 As we waited, our new friends explained to us much about geisha culture in Gion. 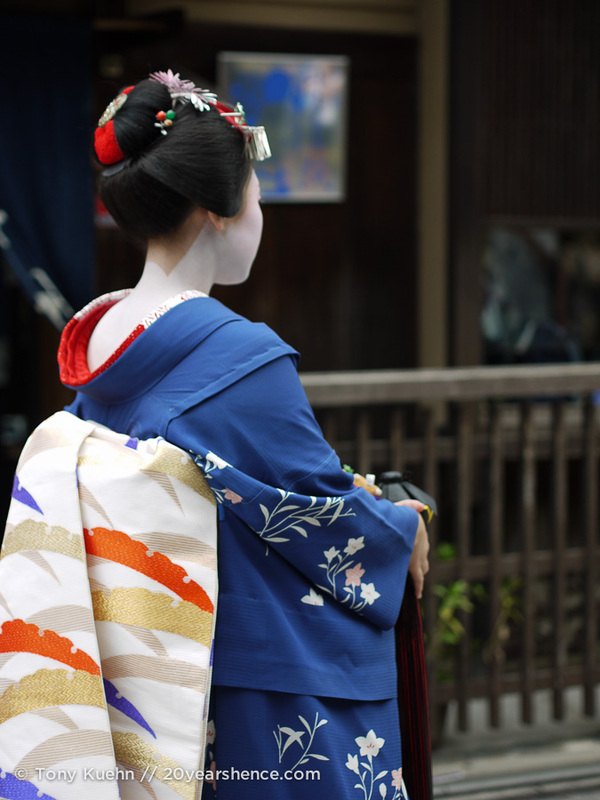 The first thing we learned is that girls begin their geisha training at the age of 16; they study intensively for one year, and then spend the next 4 to 5 years as apprentice geiko, or maiko as they are known. 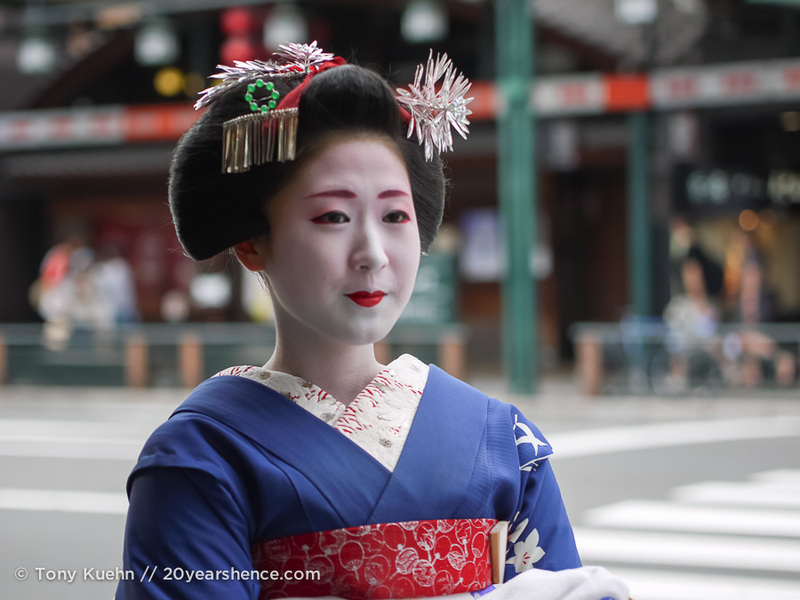 During this time, maiko will live in a group home based in Gion and continue their lessons as they train to become the ultimate hostess, for this is what geiko are. When they reach the status of geiko, they are able to have their own homes, but they are not allowed to marry nor do they get more than 2 days per month off! 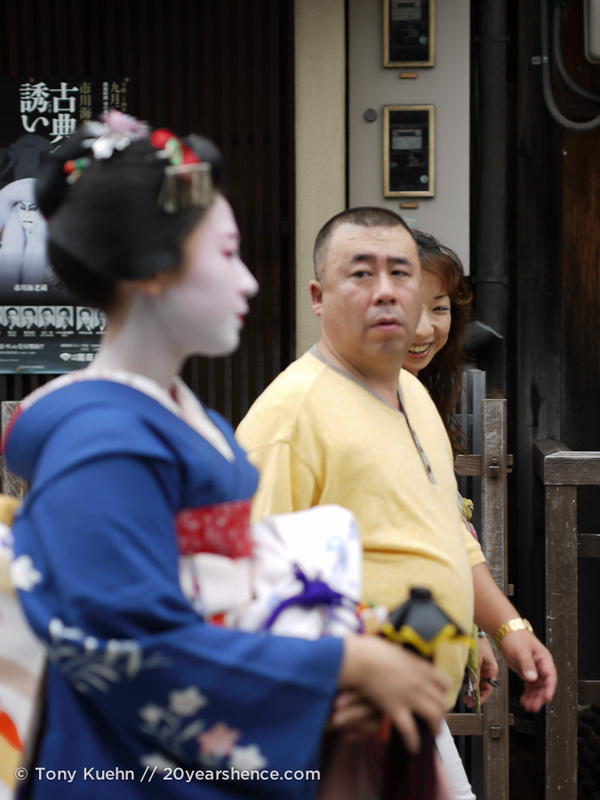 On the street, there are a few telltale signs to differentiate between maiko and geiko. 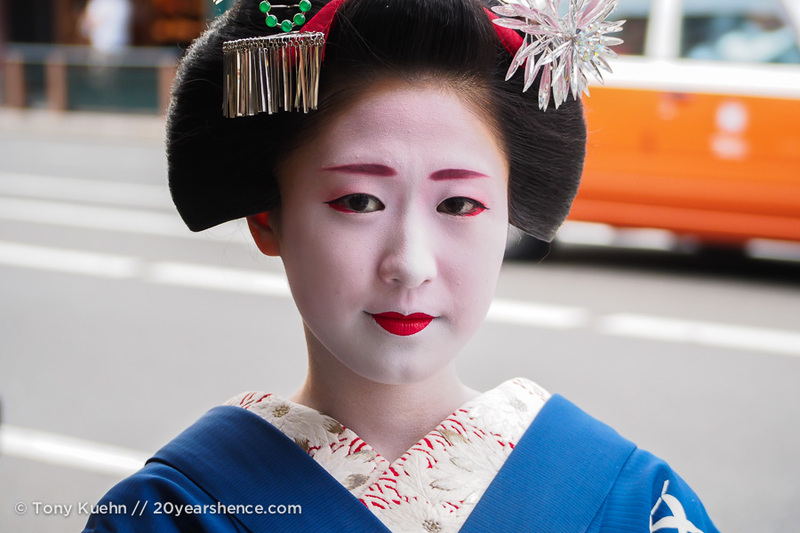 For one, a maiko’s hair is real, whereas a geiko wears a wig. 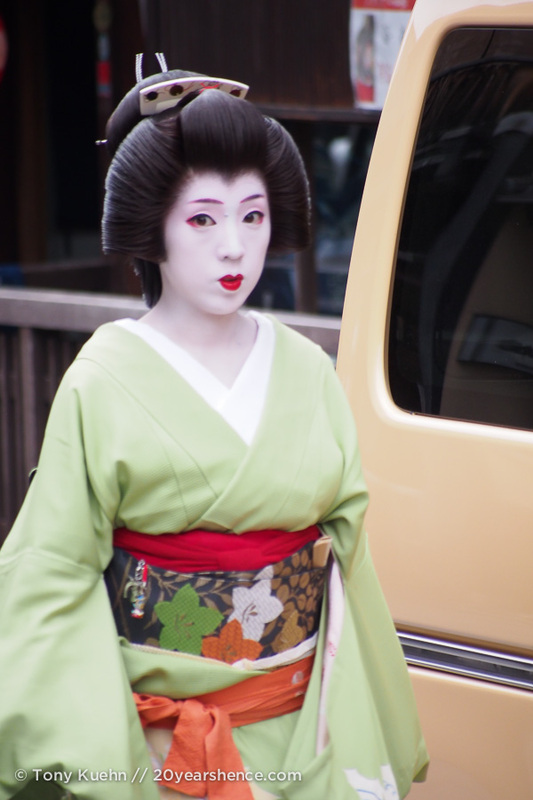 Maiko also tend to be more ornately and elaborately dressed and done up and wear far more hair ornaments than do geiko, who are dressed and coiffed more simply. 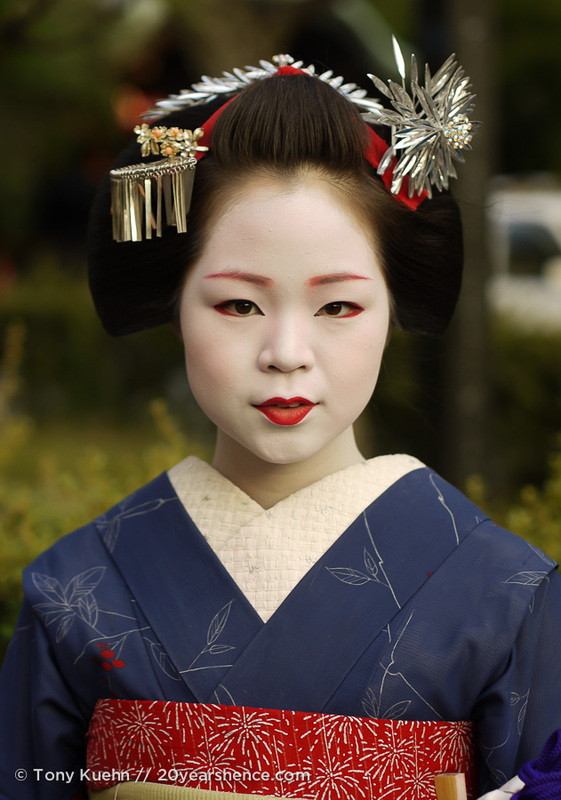 Additionally, the collar of a maiko’s kimono will be red, whereas a geiko wears a white collar with her kimono. 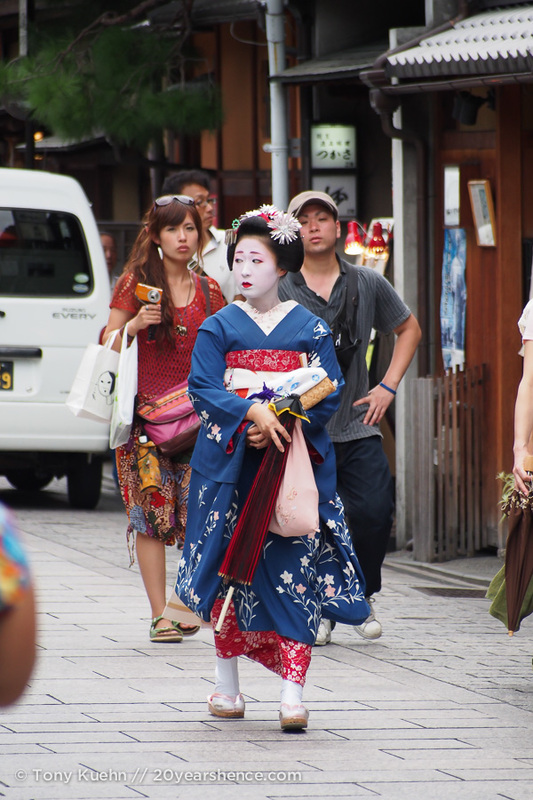 Feeling a bit overwhelmed from all this information, we nearly missed the appearance of another maiko walking down the street. Were it not for our eagle-eyed spotters, I likely would have stood their oblivious as she flitted by… so much for all those identification tricks that I had just learned! 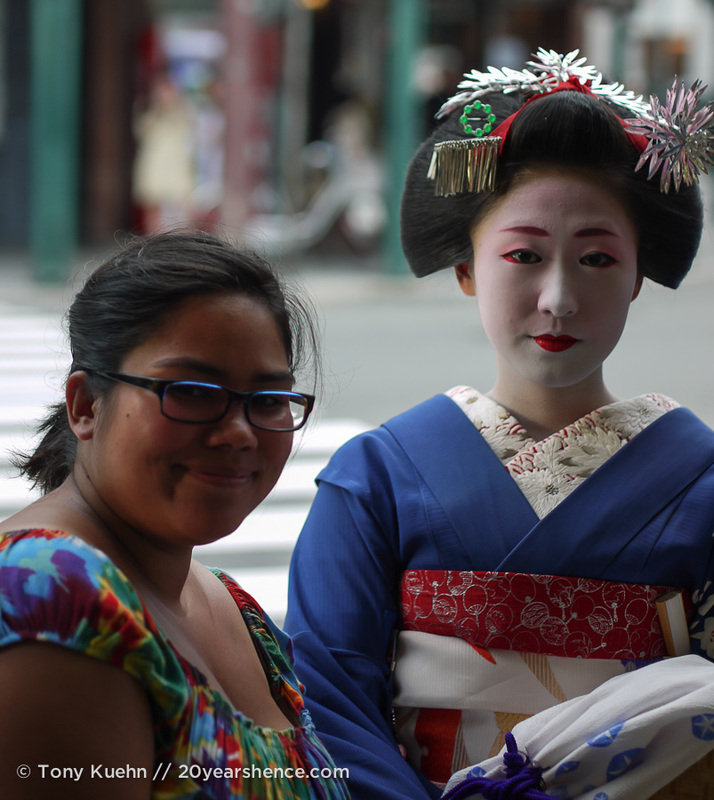 But luck was on our side and with enough of a warning, we managed to dart down the street and snap some photos of this new maiko. Although we were over the moon, our friends were not satisfied with this “drive-by” photo session. 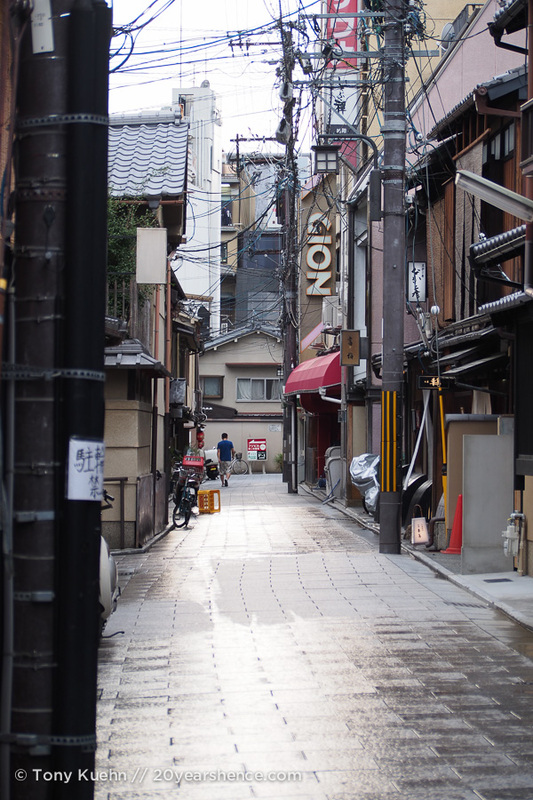 They darted off after her, trailing her to Shijodori, frantically gesturing for us to follow. 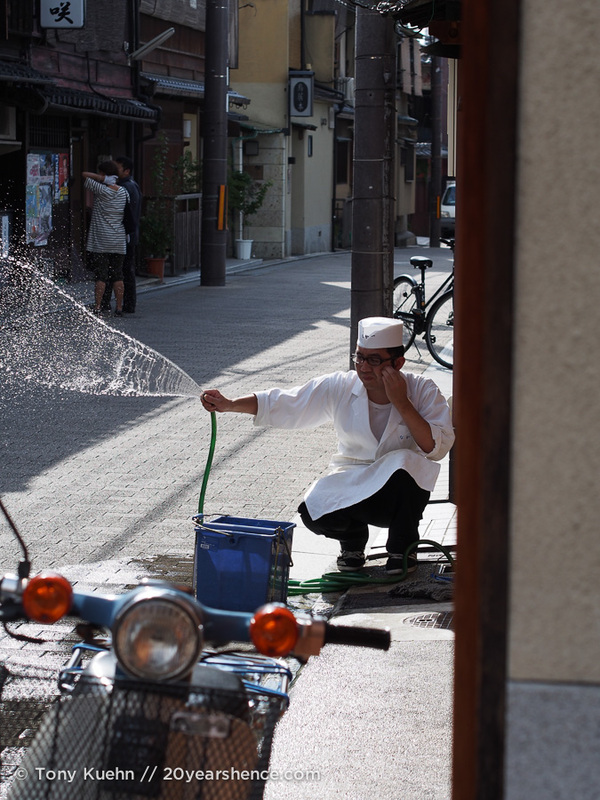 We shrugged and with a quick shared “I can’t believe we’re running after maiko” we hurried off after them. 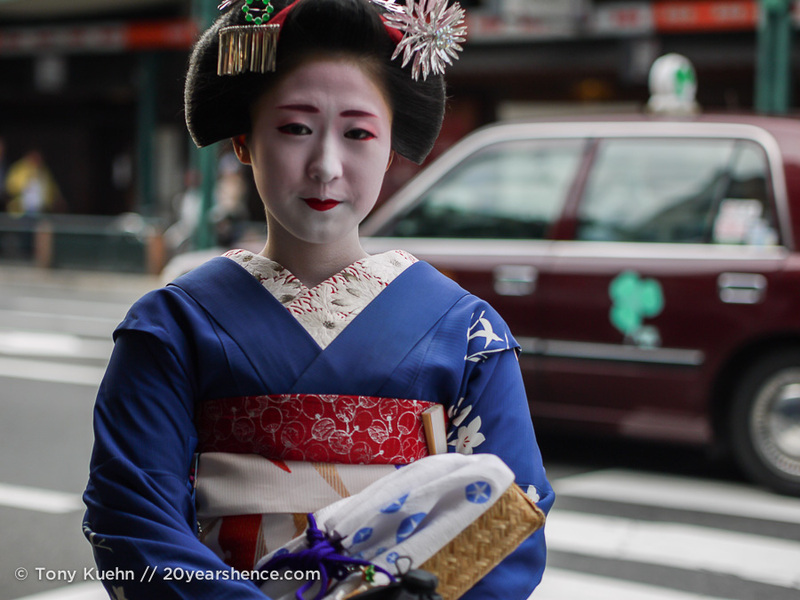 When we reached the intersection where the geiko was waiting to cross, our friends said something to her in Japanese and then said that she would pose for us. Startled, we snapped a few photos, which, in our shock, were hardly better than the ones we had taken before, a waterfall of “arigato gozaimasu” cascading from us as we tried to take as many pictures as quickly as possible so as not to delay the girl any longer. It’s kind of amazing that we managed any decent shots at all because I’m pretty sure neither of us could feel our hands. If this all seems hyperbolic and melodramatic, I understand. 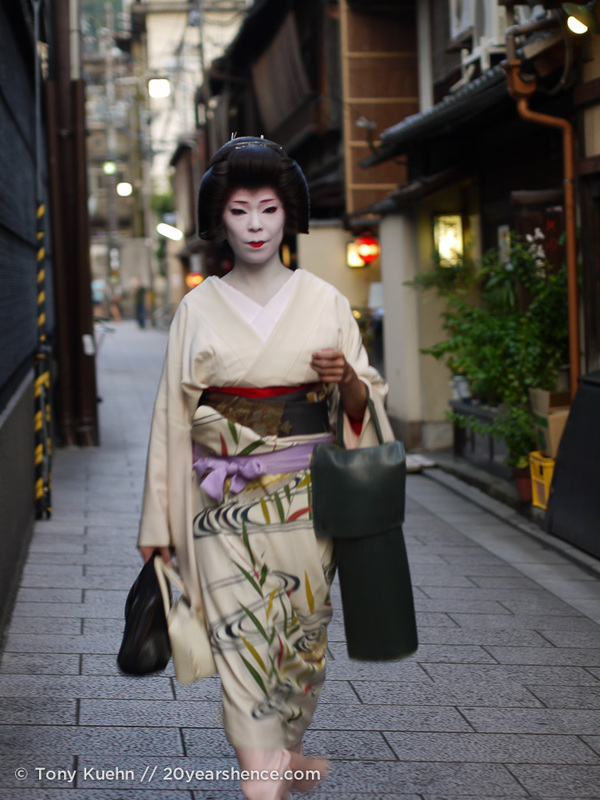 When I heard of people stalking geiko in Gion previously, I scoffed and couldn’t understand the appeal. But quite honestly, when you see these elusive women in person, it is electrifying. Their entire aura is one of utter refinement and slightly alien. 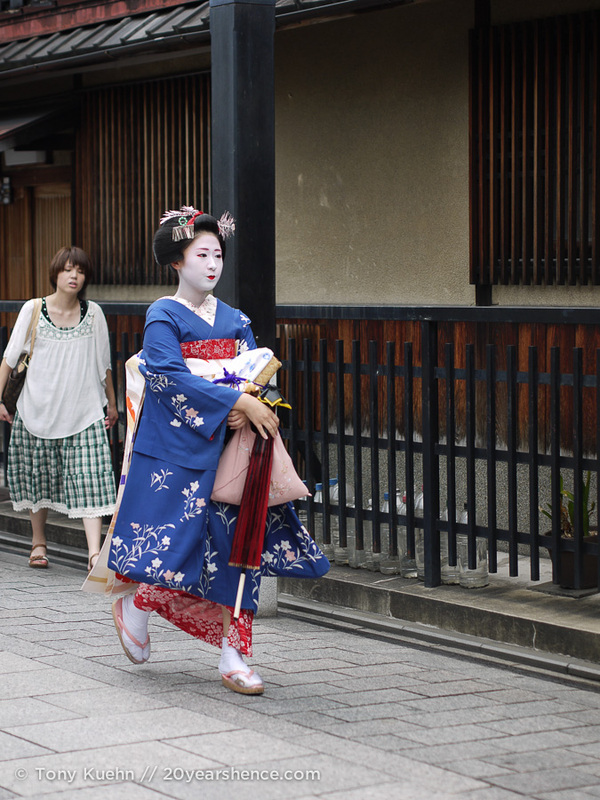 When I emailed my dad one of our photos, he said the maiko kind of looked like a ghost. 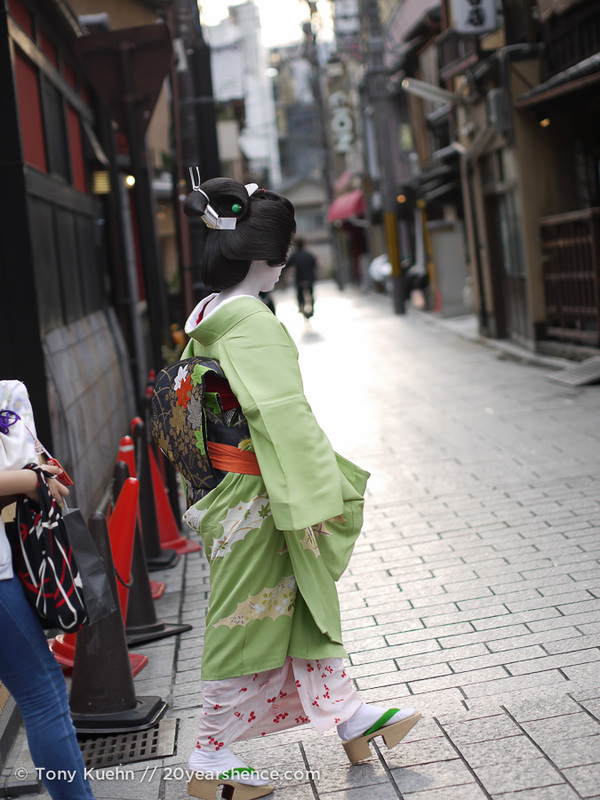 I think that’s about right, as these women seem more like spirits from a Japan long gone, floating through the streets of Gion to remind us of what once was and a secret world that is shuttered to most of us. To see a geiko up close is to feel you are gazing not at a flesh and blood woman, but on a creature not of this world, not of this time. We pretty much thought that this was the pinnacle of the day, as already it had far surpassed our wildest fantasies. I mean, we thought we would be lucky to see one geiko, and now we had seen three? This CANNOT be real, right? But this was not enough for our friends: they gestured to us to pose with the geiko, though a more intimidating photo partner I have never had. I mean, you can’t take a bad picture of a geiko if you tried, so standing beside her as she stood there so regally and impeccably done up, well, “shrinking violet” doesn’t quite cover it! Thinking we were actually done now, we prepared ourselves to effusively thank our friends and rush back to our rooms so we could pass out when this crazy adrenaline high eventually wore off and we came crashing back down to earth. 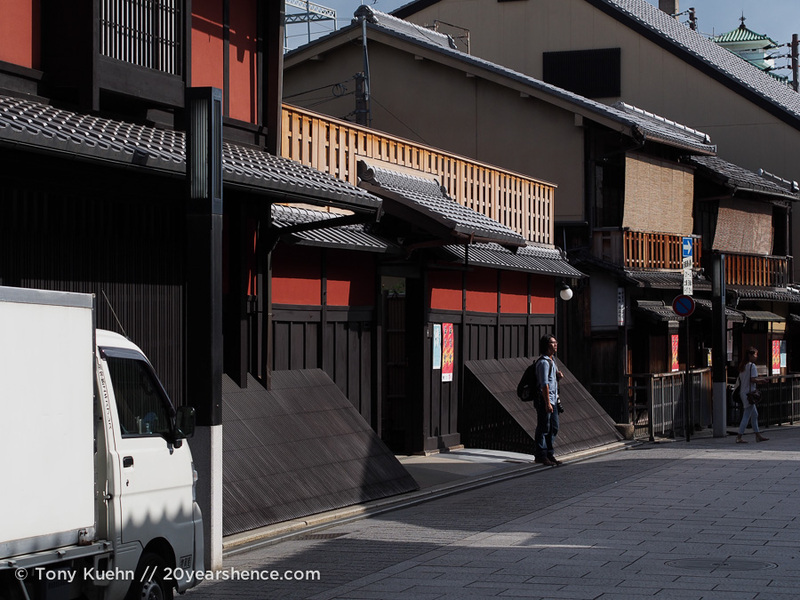 Instead, we found ourselves darting off down the street over to the geisha theater as our friends had some insider information that another geiko would be passing by there. 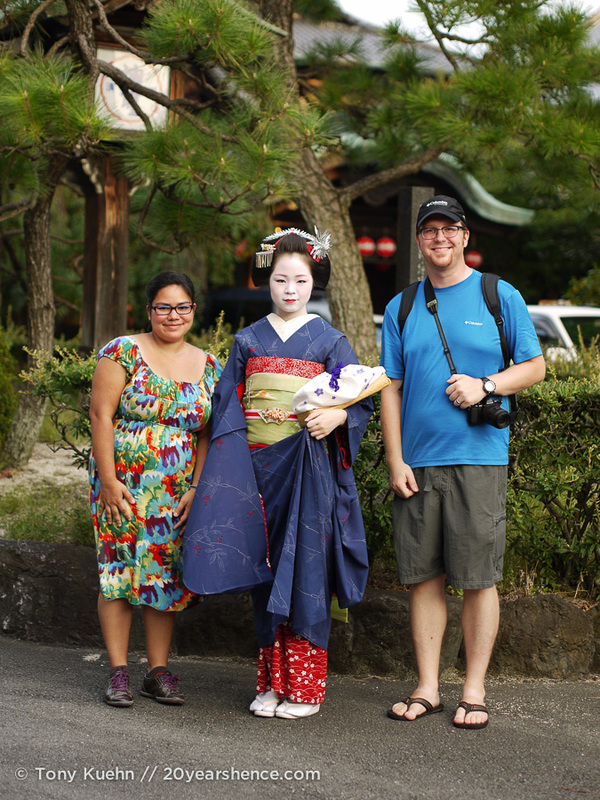 And sure enough, a beautiful maiko was soon making her way toward us and agreed to pose with us once again. All told, by the time our friends said that they were calling it quits and heading to another geiko district in Kyoto, we wound up seeing 6 geiko and maiko, and posed with 2 of them. Looking at these glorious, mind-boggling photographs that not even world-renowned photographers manage to get, chills run up my spine, and tears well in my eyes. Not because the photos themselves are a rare prize, but because they are a testament to how lucky and how blessed Tony and I were that day. These photos are reminder to me that every day can be a perfect one, if we just take the time to stop and listen, and open ourselves to the people around us and the world we are living in. Every time I look at these photos, I remind myself that we must approach each day with an honest and open heart, because people are fundamentally good and if you are willing to give of yourself, connections and joy can be found in the places you least expect them and when you are not even looking. I guess the bottom line is this: our geiko pictures make me feel lucky, not because we got them, but because of how we got them. We quit our jobs to travel, and now we are faced with realities greater than the kind of dreams our old life would even allow us to concoct. 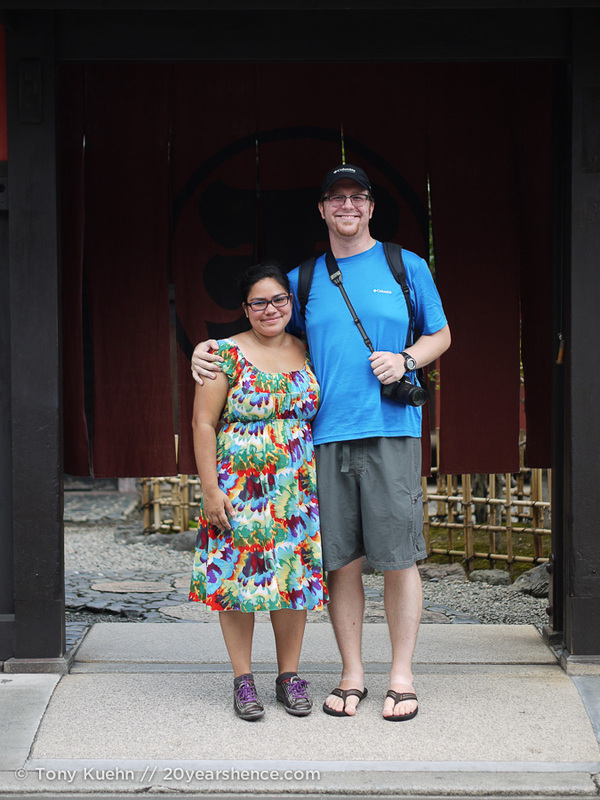 But also, these pictures never would have happened if Tony & I had been on our own that day in Gion. We would have snapped those few blurry paparrazi shots and then went on our merry way. Instead, we got to witness firsthand an extraordinary kindness of spirit, and that is why I feel lucky. Because whether they are blurred or beautiful, a picture is just a picture, and as rare as geiko may be, that time we shared with two people who started off as strangers and became friends? That is even more uncommon, but it is my hope that on this trip, we can continue to find and forge these types of moments more regularly. These stolen moments with geiko were precious, but those with the people who orchestrated it all, even more so. Looking at the photos, telling the tale, it all seems like once-in-a-lifetime serendipity… but I know that if Tony and I continue to reach out, we can make serendipity a regular reality. Yup. That pretty much sums it up, doesn’t it? Looks like you’re seeing many wonders, keep on keeping on…..
We certainly are! Hope you and Maureen are still enjoying the Cooper, though I am thinking it is probably too cold to ride around with the top down (yours and the car’s… 😉 ) now! Yeah, we spent the next few days in a bit of a daze! We couldn’t believe any of this happened! Thank you for the comment! We’re both over the moon with the photos we managed to get, and of course, it’s all due to the incredibly kindness of the Japanese people! Yes, Wow!!! I was ‘wow’ing at the willow tree moment and then… Wow wow wow. Beautifully written. Stunning photos (yes, even the paparazzi ones), and such a lovely perspective on your once-in-a-life-time experience. I drank this in! Thanks, Sarah! So glad you enjoyed this post! This was a really important moment for me, so I’m happy my words were able to convey the enormity of it all for me (though the pictures themselves probably tell much of the story!). Great story and amazing pictures! I love that those people went so out of their way for you, it makes me feel ashamed that I often hurry past tourists while on way to/from work in London without stopping to ask if they need help or to strike up a conversation. You were lucky enough to experience the kind of unique adventure that money just can’t buy – I really hope Andrew and I are lucky enough to have experiences like this while we’re travelling too. Amy, we had the exact same thoughts after this: how may time have I seen obvious tourists (struggling or not?) that I have passed by without a second thought? This experience made me vow never to do that again! It’s the least I can do to pay back this kindness, and I suspect that being on the giving rather than the receiving end has its own rewards as well.